One of the chief objections a young reader had to the first version of my middle grade manuscript was that it wasn’t funny. She said she likes funny books. In the comments about genre-identity yesterday, Erik (about the same age as the reader mentioned above) said that he liked writing funny stuff. Kids, like Blake Edwards and me, love humor, the broader and less nuanced, the better. In fact, it’s very important when injecting humor into one’s writing for kids to remember that their idea of what’s funny doesn’t always mesh with an adult’s idea of what’s funny. Little ones, especially, are still developing an understanding of why things are funny – witness a little boy of my acquaintance who knew that there was a reason the grown-ups laughed when his daddy asked a riddle about “How many British Telecom men does it take to change a light bulb?” but he just didn’t get the format, nor the point of the riddle, so it became, “Daddy, I tell you a joke.” “All right, Matt, what is it?” “Three British Telecom men!” And the little boy would go into gales of laughter. I’m sure we can all name authors who know how to write humor for kids. Susanna Leonard Hill is one. Her Can’t Sleep Without Sheep is genuinely funny, without overtly trying to “be a funny book”. Her text, combined with Mike Wohnoutka’s illustrations, makes giggles rise up as the reader sees the various animals attempting (without success) to replace the sheep that are tired of being counted. 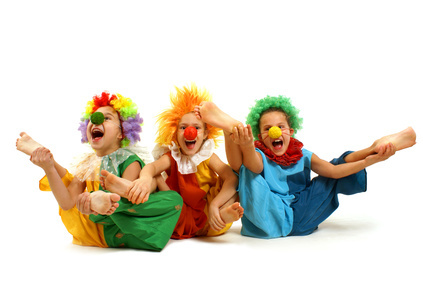 There are resources to help us understand how children’s sense of humor develop – from relatively scholarly articles to suggestions of how to help one’s child develop a sense of humor. These can help a writer, too. Best idea of all is to get together with some kids and GIGGLE! Remember what made you laugh as a kid, see what makes your own (or someone else’s) kids laugh. Watch a Blake Edwards movie (likely not with your kids) and see what ideas crop up. Relax and have fun! Do you inject humor into your writing? What makes the kids around you laugh? What books make them laugh? Great post, and a lesson to all of us who want to write for kids. Yes, I would say 90% of what I write is in the humorous category, tending toward the whimsical. There are multiple levels of funny, and I generally fall in the quieter “smiling through the book” and “escaped snickers” levels, but rarely (never) the laugh-out-loud level. What I really love in PBs is a sense of the absurd, which is why I adore books like Click, Clack, Moo. Funny can’t be forced. If I set out saying I’m going to write a laugh-out-loud book, which isn’t my natural level of funny, I just know it wouldn’t even register on the funny scale and it would just be awkward for everyone. Funny HAS to be organic. I always hope my stories will be amusing, but I try not to put that extra pressure on myself when writing. Instead, I try to let the story grow into whatever the story wants and needs to be. The other problem with funny is that funny is different for everyone. I’ve gotten reports of kids giggling through one of my stories, and I think, “Huh, really?” I’ve had blogs recommended to me with “You have to read this; this writer is HYSTERICAL!!!!!!! !” and I go there and see all the comments like “I just spit soda on my screen” and “Falling out of my chair!” and I think, “Huh, really?” When it comes to funny, I sometimes feel like I’m on a different planet than everyone else. All this means is that someone may find your book hysterical and someone else may find it meh. Write how you write and the funny will come. Or not. Thank you, Renee — you didn’t hijack the comments, you added greatly to the discussion. Thinking about your statement “funny can’t be forced” it occurs to me that it must be hard to be a comedy writer. Having to be funny, knowing you’re being paid to be funny, yet trying to make that humor seem natural. Humor can’t just be a series of jokes in a book (unless it’s a joke book), but real humor can really bring a book to life. Agree with Renee on all counts, different people do see things differently. What is funny for one may not be funny for another. I am reminded of my younger brother (12+years apart), when sitting in a high chair watching the tv eating having master the art of spoon feeding himself. He would be totally serious during kids programs, but we always knew when the adds were on as he would split his sides laughing. So adverts of breakfast cereals, washing detergents and price bargans in bedroom furniture were funny?…. go figure!! Love the story of your brother’s reaction to the ads on TV! I wonder — are the really funny picture books that way because the author worked at making them funny, or because that particular person just can’t help writing in that way? I like to read funny serious books. I like it when books with serious stories have funny parts to them. Like “Rachel Spinelli Punched me in the Face” was about a kdis whose mom abandoned him and his dad and they had to move. I didn’t think I’d like the story but there were funny parts to it (even the title is funny -like “Can’t Sleep Without Sheep”). It made me want to read the story and I found it was a really good book. I agree with Renee. Funny can’t be forced. Everyone in them has the ability to be funny, children’s story writers especially, because we live our lives studying our audience and THEY are a barrel of laughs! Often an idea will be triggered by a funny thing a child has said or done — one can’t help but be funny when writing about it. You’re welcome! It’s a delightful book! You’re right, life is never all one or the other, and if we’re trying in our writing to make our books as real as possible, there will be humorous things and there will be serious things. Although humor is definitely different for all ages, we all love to laugh, wouldn’t you say? When I cleaned the top of my desk today, I set a couple of things on the desktop to look at when I look up from my writing. On my left is a picture of a woman laughing (that particular woman has a delightful laugh, and is also known to be fairly easily provoked to giggles) and on my left is a card depicting two girls, about age nine, giggling together. It’s one time when we’re “real” and we really let go and show our true reaction to something, when we laugh. Excellent post! My own boys prefer a good balance of drama and humor in their books, especially in the ones that I read aloud. Right now I’m reading the Septimus Heap series to my 14yo son (he still loves being read to, lucky me!) and it seems to have the perfect blend of tension and comic relief. It’s what he loves about the Tom Sawyer and Huck Finn books, too. Thanks for writing and good luck! Oh how lucky you are to have a 14yo who still loves being read to! Long may that continue. Fascinating, funny, and so true! Kids aren’t tiny adults. A kid can giggle himself into a frenzy of hiccups, over one word that isn’t funny at all (not even in context). Just the sound can do it. .
Great post! I love to eavesdrop on kids. Dave Barry once wrote an essay about driving a carpool, and how the kids in the backseat tended to forget he was even there. He got some great material in those carpools! Dave Barry’s humor is such fun. I can well imagine he’d have a great time with the material kids inadvertently gave him!